This iconic photo competition, based at the Natural History Museum and now in its 47th year, might not appear to be of direct interest to readers of Landscape GB. However, it has several categories that are landscape orientated or compatible, ‘Wild Places’ being the most conspicuous. Others which may appeal are ‘In Praise of Plants and Fungi’; ‘Urban Wildlife’ (which can be of wild plants in an urban environment, not only animals); Nature in Black and White (this includes wild landscape as the principle subject, and encourages creative use of dodging, burning and toning); and ‘Creative visions of Nature’ (conceptual depth, artistry and vision are the essentials here, and landscape is as valid a subject as the animal world).There are also special categories that include landscape as a major dimension, including the One Earth Award, and Young Wildlife Photographer of the Year. Having been lucky enough to attend the Award dinner last year in the Great Hall of the Natural History Museum I can attest to the glamour and prestige of being an award winner (sadly I was not one, merely a guest!). It is a fantastic occasion, and to be involved in the final placings and therefore the exhibition and Awards is an unforgettable experience. The Natural History Museum’s presentation of the work is quite magnificent, with backlit transparencies being the exhibition style for the last few years. Each year the show also travels, ensuring wide media interest in the regions, and great public exposure for all exhibitors and award winners. So why am I promoting it? 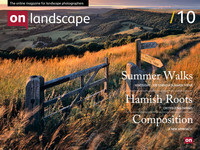 Well, I am on the judging panel this year, and I want to see landscape photography really strongly represented. I am also aware of the hugely talented readership we have at LandscapeGB. So guys and girls, do please enter WPY – you have until 18th March!